Acai (pronounced ah-sigh-ee) skincare has taken the natural beauty industry by storm. Find out more about this unique berry with exciting healing properties. Acai skincare gets its name from the acai palm. Native to Central and South America, the acai palm produces a small and round dark purple fruit that can be compared slightly to a grape. 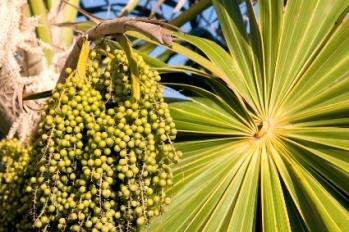 The popularity of the acai palm began with the discovery of its dark pigmentation. Much like other natural ingredients, this is often a signifier of high antioxidant content. Antioxidants have numerous health benefits and can be used to slow the aging process. Needless to say, this brought the acai palm quickly into the spotlight and its fruit is in high demand. While there are some skincare companies selling and developing acai berry topical treatments, many studies have shown eating the berry itself can yield the same result. In fact, one leading dermatologist listed the acai as one of the top ten foods to eat in order to keep your skin healthy, youthful, and gorgeous. As one of the most powerfully nutritious foods in the world, you can purchase it as a berry and more popularly as a juice. Besides all its punch of antioxidants, it also contains Omega 6 and Omega 9 fatty acids, which can keep your cholesterol under control while still bringing restoration to your skin. Sambazon is one such manufacturer carrying healthy acai-based food and drinks. From smoothies to sorbets, you will find a variety of yummy treats on their website that will sway you into joining the ranks of those who make the acai a part of their daily diet. If you don't feel like eating exotic berries, you can definitely purchase some quality products containing the acai. Elysee Acai Brightening and Radiance collection is one such series of items. Able to restore your skin to a brighter and more youthful appearance, Elysee has cashed in on the power of the acai with this amazing trio of skincare ingredients. This company is known for its ability to develop the best skincare remedies with the use of antioxidants, so it is no wonder they turned to this unique plant for answers! While the acai palm was fairly unknown in this country, Oprah recently discovered it and featured it on an episode of her popular syndicated show. Since then, its demand has skyrocketed, especially in beauty-conscience regions of the U.S., such as Southern California. Now the fruit is abundant in a variety of products found at any health food store, as well as in a fair number of beauty items. You can take advantage of the berry's availability and create your own acai skincare treatment as well. Able to be used in a mask just as you would create a strawberry or avocado facial indulgence, the acai berry can be crushed and applied to the skin for ultimate oxidation. Since the acai berry has up to four times the amount of antioxidants than its rival fruits, you will be doing your skin a favor and pampering yourself with an exotic treat at the same time.